This classic appetizer is always a party favorite. Grilling crisps up the prosciutto perfectly without overcooking the asparagus. Dijon Dipping Sauce: Stir mayonnaise with mustard, honey, lemon juice and salt and pepper; keep chilled. Prosciutto Wrapped Asparagus: Preheat your George Foreman Indoor/Outdoor Grill for 5 minutes with the lid closed on highest setting. Meanwhile wrap prosciutto slices around each asparagus spear. Drizzle lightly with oil. Place wrapped asparagus on grill and cook, covered, for 2 to 3 minutes per side or until asparagus is tender and prosciutto is crisp. Serve with Dijon Dipping Sauce. 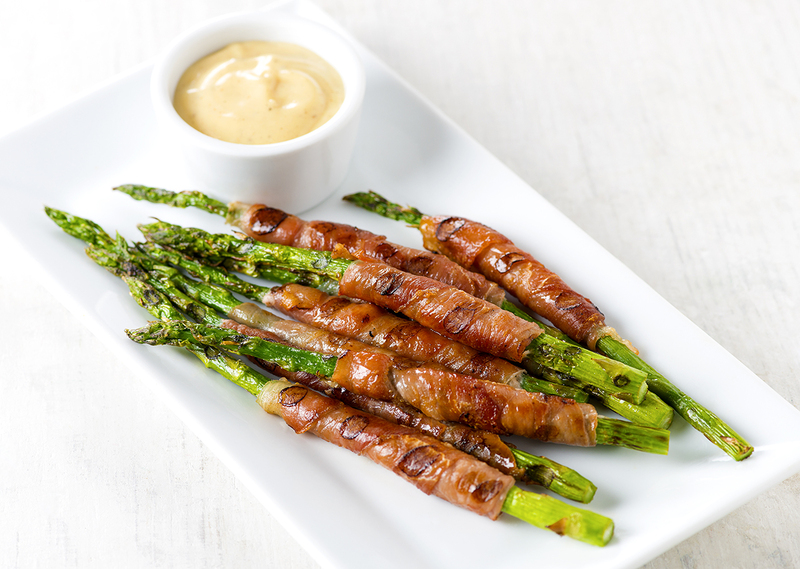 Tip: For an easy party appetizer, make the Dijon Dipping Sauce up to 2 days in advance of serving and wrap the asparagus spears with the prosciutto a day in advance of serving.